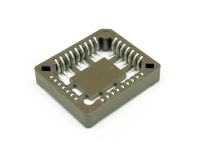 IC Socket PLCC32, for SMD Mounting, miniature design. For mounting in spite of the chip. Identical foot-print, 16,89 mm x 19,43 mm x 3,81 mm.